Hi all, I'm now 2yrs old. It has been a tough 2 yrs,and I still have a few small issues,nothing we can't over come,like all the rest. 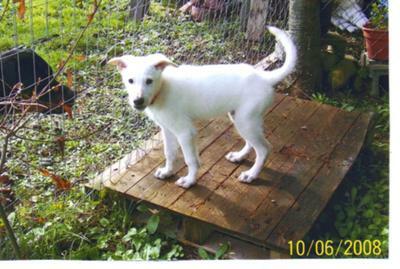 When I was Rescued I had a lot of issues,and was not sure I would make it to over come those,but as you can see,(before pict as starved pup),My family has worked really hard and have been very dedicated to help me not only survive,but to grow into this beautiful and majestic boy I am today.And still growing and learning. It goes to show how some people can make a differance in a dogs life,I was fortunate to have been found and saved by loving people who cared,worked hard and saved me from a horrable death. We give unconditional love even though we were not loved the same.I love my family and am very eagar to please and learn all I can. I have been given a second chance and every day is a new beginning,new learning experiance,and a new lease on life. Hi Debbie. 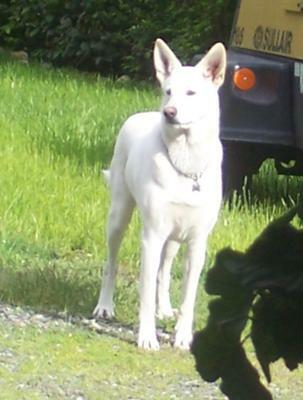 Thanks so much for taking the time to come here and share your own German Shepherd rescue story and picture of your beautiful white German Shepherd Dog Sky with us all. Sky is so pretty and very lucky to have you come into her life. And what great pictures of Sky that you have shown us all here too. 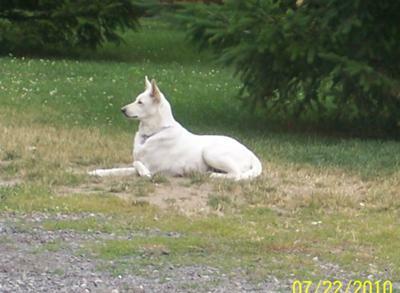 She looks so comfortable - and has really developed into a gorgeous white German Shepherd Dog. Beautiful photos. Nicely done - she is so pretty! You are wonderful people. God Bless You for the unselfish devotion you gave to Sky.